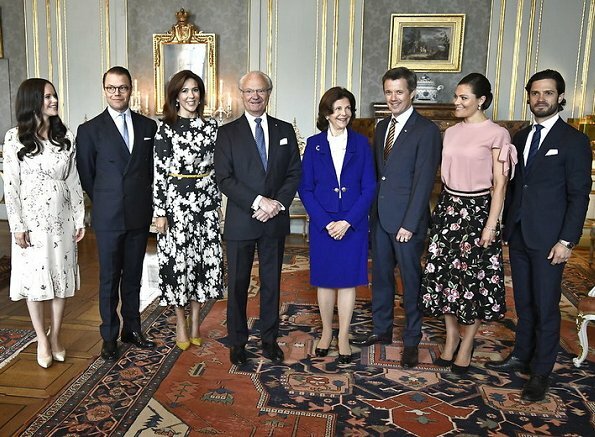 On May 30, 2017, King Carl Gustaf and Queen Silvia of Sweden held a lunch for Crown Prince Frederik and Crown Princess Mary of Denmark at the Royal Palace of Stockholm, and the lunch was attended by Crown Princess Victoria, Prince Daniel, Prince Carl Philip and Princess Sofia of Sweden. Princess Sofie is indeed a goddess. She looks like a model princess in the photo. Queen Silvia never disappoints too! Everyone looks a bit 'meh'. I like victoria's blouse and silvias Suits but nothing wowww me. Toutes ces horreurs ensemble ! Pitié !!! I absolutely love Victoria's outfit! Very feminine and beautiful. The bows on the sleeves are odd, but I think she pulls it off well. Sofia's dress is nice, but looks like a grandma dress or a nightgown or something. I like Mary's dress, but is the skirt pleated? I would prefer if it was just straight. Sofia looks so sweet and pretty. Victoria should let her hair down already! The queen's hair is pretty bad too. I liked Queen Silvia the best. Less fuss and the end result looks the best for an official event. Sofia's curls were a disaster and that center parting has to go! It makes her face look thin and too long. I love Victoria's look here - she looks lovely in pinks. Sofia's dress is just a bit blah and she looks washed out. I don't like Mary's dress especially - the print is quite nice but I find the length a bit matronly. I like Victoria's look a lot; very feminine. Mary's dress has too much material, though I do appreciate those yellow shoes and purse. Might have been better with a shortened sleeve, maybe three quarters. I think Sophia looks lovely. I like that she sticks with her center part! Sofias hair is not good!